Olivia Harrison with her awards from tumbling. 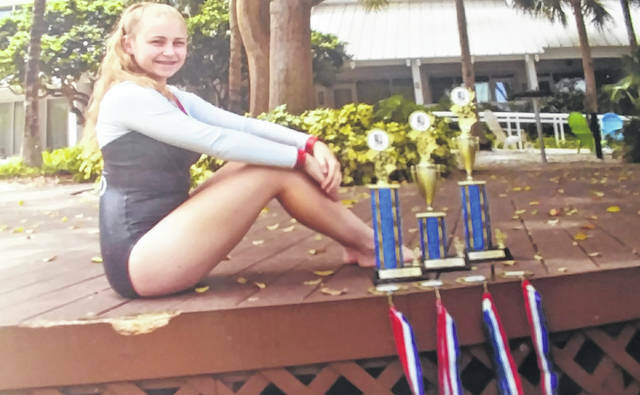 FORT LAUDERDALE, Fla. — Olivia Harrison, member of the Will Power Tumbling Team and the Ohio All-State Team, recently participated in the U.S. Trampoline and Tumbling Nationals held in Fort Lauderdale, Fla.
Olivia received national runner-up in the trampoline synchro competition, fifth place on double-mini and eighth place on rod floor. Olivia brought home three top 10 trophies and four medals. She is coached by Debbie Barber.